Pathfinder students participate in acting class (photo: Helena Lyng-Olsen). 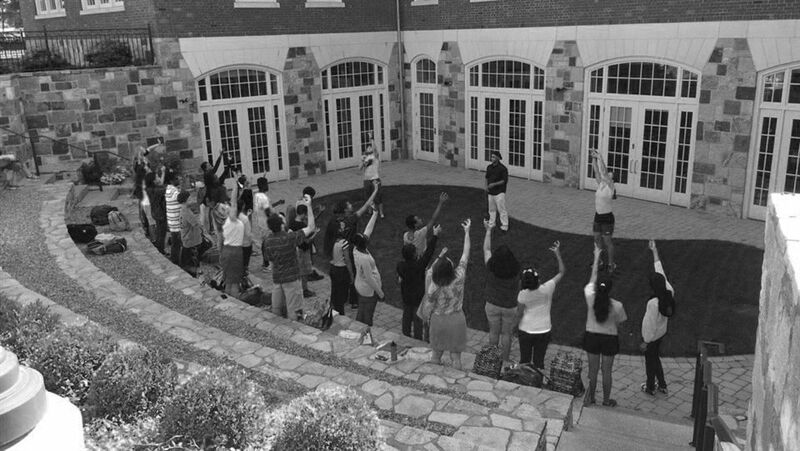 This past academic year, the organization formerly known as Breakthrough New Haven has been renamed and refocused into Hopkins’ very own on-campus program: Pathfinder Hopkins School. Although the program’s mission to enrich the academic lives of middle schoolers hasn’t changed, crucial aspects, such as content and the hiring process for teachers, have been remodeled and improved. The first year of Pathfinder is currently being led by its Director, Michael Van Leesten, and the new Assistant Director of Pathfinder, Ian Guthrie. The origins of Pathfinder can be traced back to the Summerbridge New Haven program, founded in 1992, by Michelle Pierce, an English teacher at Hopkins at that time. The program was exclusively run in the summer and students from New Haven onto the Hill for a six-week academic program. In 2006, Summerbridge became Breakthrough New Haven. As a new program, Breakthrough still focused on eighth and ninth grade students. Around the period of the transition, the program included a summer intensive academic program as well as classes in core subjects and SSAT prep throughout the school year. During this time, Breakthrough New Haven was part of a national program known as Breakthrough Collaborative. The New Haven branch hosted at Hopkins had to stay within parameters set by the national organization. This past summer, Breakthrough New Haven split from Breakthrough Collaborative and became Pathfinder, an independent organization free from the restrictions of the larger model. Now the local administrators have more say about the direction the curriculum, teachers, and organizational structure. From this newfound independence, Pathfinder has gained the ability to guide itself in a direction tailored to the needs of New Haven area students. Whereas Breakthrough Collaborative is planning to require a high school enrichment component at each branch, Van Leesten explains, “We have an unusually dense concentration of college preparatory schools in our area. So we asked who could better prepare for college than a good college preparatory high school program?” Instead of focusing on expanding into work with high schoolers, Pathfinder will work to strengthen the middle school program, helping and preparing students to apply to prep schools in the area. Many teaching fellows who have gone on to become professional teachers came back and suggested hiring professional teachers as high schoolers are simply too inexperienced to teach all of the classes. Lillian Tipton ‘18, who taught Breakthrough last school year and is currently teaching this year, has expressed similar concerns, saying, “Because we have limited time, we do not always get enough time to learn fully about teaching techniques. I wish we had more time to teach the kids and to learn about being teachers.” Pathfinder students will now be taught by those who have spent considerable time learning to teach. With a new name and an improved system, the Pathfinder program is on track to educate and improve the lives of eager middle school students in New Haven.